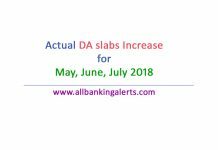 Expected DA slabs increase for Bank Employees (Clerk, Officers, Bank staff) – for month of November, December 2018 and January 2019. We continuously update you here about expected DA slabs increase for bank employees (Clerk, Officers, Workmen). Dearness allowance is revised every quarter on the basis of consumer price index (CPI) data published by Labour Bureau. This time, DA for bank employees is expected to increase by more than 6 percent. 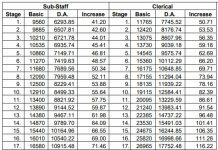 Now in this article, we will try to predict the Dearness allowance increase for month of Nov, Dec 2018 and Jan 2019 for bank employees through DA calculation formula. CPI data for months of July and Aug 2018 is already published on official website of Labour Bureau. CPI data for month of September 2018 will be published very soon. Consumer Price Index (CPI) is announced by Labour Bureau for month of July and August 2018 which is 301 for both month. Expecting CPI data to increase by 1 point for month of September 2018 i.e, 302, what will be the expected DA increase – here is the calculation. Divide 2438.20 by 4 to calculate DA slabs for quarter = (2438.20/4) = 609.55 or 609 (rounding off) on which 0.10 percent DA is payable. So DA slabs percentage for Nov 2018, Dec 2018 and Jan 2019 will be 60.9 percent. So expected DA increase for month of Nov, Dec 2018 and Jan 2019 will be 6.8 percent. 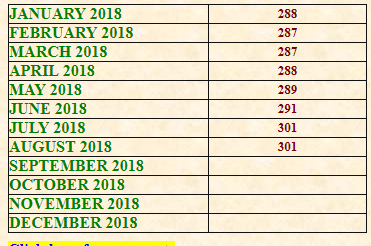 Note : Final DA Slabs increase for Nov 2018 for bank employees will be published here on release of CPI data for month of September 2018.